To be introduced in fast-growing regions around the world, the launch of New Quester highlights UD Trucks’ unwavering commitment of “Going the Extra Mile” for customers’ businesses. Håkan Karlsson, President, Volvo Group Trucks Asia & JVs, said “Quester comes from the best of three worlds: UD Trucks’ strong Japanese heritage and craftsmanship, Volvo Group’s innovative technology and strong local manufacturing and customer support. UD Trucks is recognized for pioneering new innovations within the Japanese trucks segment, and New Quester is testament to our global industry leadership. New Quester’s enhanced fuel performance also aligns with the increasing focus on environmentally friendly regulations to curb fuel consumption in target markets. New Quester achieves fuel economy and quality standards for heavy-duty vehicles of Euro 3 to Euro 4 in all target markets, effectively reducing overall carbon footprint globally. Driver fatigue continues to be a serious industry challenge, contributing up to 20 percent of road accidents in the world . To address this, New Quester is developed with an air suspended cab and ride comfort package with reduced cab vibrations up to 18 percent. 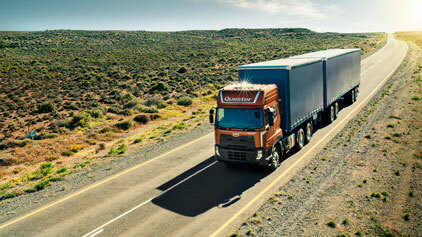 Driver’s comfort is also enhanced with ergonomic seats and lumber support for long-distance assignments. New Quester increases overall drivability and safety for drivers with features that focus on increasing drivers’ comfort levels and reducing driver fatigue. New Quester trucks are equipped with UD Telematics, which has the capability to connect directly to UD Trucks workshops to monitor and detect each vehicle’s condition and service needs before a potential emergency occurs. Preventive maintenance analysis guides customers with monthly driving behavior and fuel consumption reports, ensuring higher uptime and more optimal fuel economy over time. Built to deliver UD Trucks’ ethos of “Ultimate Dependability”, New Quester increases uptime through UD Extra Mile Support. Offering an extensive network of well-trained service technicians, it provides quality aftersales service with genuine parts, service planning and vehicle handover training that optimizes fleet performance. New Quester will be available in key markets around the world in phases from mid-February 2019 onwards. Thailand, which also serves as UD Trucks’ export hub to growth markets in Southeast Asia, will be the first to launch New Quester. Following the respective market launches, New Quester’s driving adventure film series filmed around the world will showcase how the truck supports businesses in tackling actual, market-specific challenges faced by truck companies in fast-growing regions around the world.